June’s Magical Yangmei Fruit Brings Thoughts of Love, Family in China | WWAM Bam! Nevermind the high humidity. Or the relentless sunshine. Or anyone else who tells me how unbearably hot summers are in China. 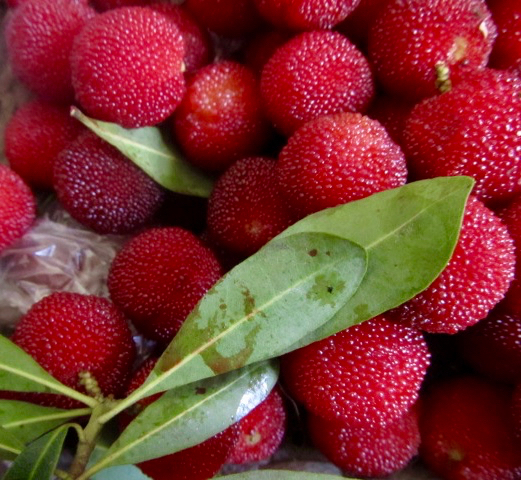 Who has time to worry about that in June in China, a month that, for me, is inextricably entwined with the arrival of what I consider the country’s most magical fruit – yangmei or Myrica rubra. If you’ve never bit into the juicy, ruby red goodness that is a yangmei, imagine the world’s most succulent red fruits (like my favorites of cranberry and pomegranate) packed together into one tiny, koosh-ball shaped package. It’s a little bite of ecstasy that will dance across your tastebuds and probably dribble onto the table or your summer clothes, making you look like you indulged in some red wine…but who cares when there’s yangmei on the table? Yes, it’s that delicious. And it only grows in China, with much of the fruit produced in my husband’s home province of Zhejiang. For me, though, it’s not just the fruit that’s so delightful – it’s also how consuming this fruit has become a yearly ritual for me and my husband, and even his family. Whenever I think of yangmei, I think of my husband Jun, making sure to pick it up at the local fresh market every time he makes a purchase there (as long as it’s the month of June, yangmei will be on his shopping list). I think of him making detours on the local roads in his county whenever there’s someone selling it beside the road. I also think of him washing bowlfuls of it for me – and, if it’s from the early harvest, watching that characteristic grimace rise to his face, because the fruit are a little “too sour”. Someday, I hope to share the magic of yangmei with my family in America. But for now, I’ll savor this special fruit, which makes the month of June, with all its heatwaves and humidity in China, a little more delicious. Pingback: Photo Essay: Favorite Summer Foods at My Chinese In-Laws' Rural Home | WWAM Bam!